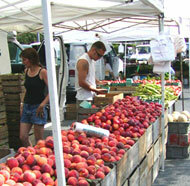 Links to Maryland farmers' markets. Shopping at a farmers' market is a great way to meet local farmers and get fresh, flavorful produce some even have live entertainment. Baltimore's fragrant, gleaming Lexington Market, the world's largest, continuously running market for more than six generations, marks its 220th anniversary this year. The Pennsylvania Dutch Farmer's Market, known locally as the "Amish Market", is located in the 290,000 sq ft. Annapolis Harbour Center in historic Annapolis, MD. Is a producer only market which offers farm grown fruits and vegetables from farms in Maryland, Pennsylvania and Virginia. The idea of an producer only market is critical for this market-we want to provide economic support for local farmers in the Chesapeake area.Our vendors grow and/or make everything they sell during their natural season! The Riverdale Park Farmers Market is your source for local high quality organic and conventionally grown fresh vegetables and fruits, award winning honey, European style baked goods, pasture fed meat, bedding plants, artisan breads, hand made soaps, pottery, jams and jellies, fruit syrups, fresh cut flowers, and talented local artisans and musicians of all sorts. Our market is a "producers only" market, so you know that everything here is locally grown or made.